It’s no secret that the San Francisco Bay Area boasts some of the nation’s most agreeable weather thanks to a mild year-round climate that generally doesn’t have severe events such as blizzards, hurricanes, and tornadoes. However, Bay Area residents, especially those in the sunny South Bay, must always be mindful of one nemesis: the sun. It might seem a bit cold-hearted to look upon our provider of beautiful sunshine and pleasant temperatures with disdain, but the fact is UV rays from the sun can do considerable damage to not only the body, but also the home. The simple solution is to grab some sunscreen for a day under the sun, but continually slathering lotion on can be bothersome. And it still doesn’t protect your hardwood flooring or furniture from sun damage. Instead, there’s a less greasy and more fashionable way to ward off sunrays from the skin and home: motorized retractable awnings. Installing an awning for dealing with the summertime heat in San Jose, and the Bay Area in general, is a great idea, but the city’s climate makes getting an awning an ideal choice regardless of the season. San Jose has an average of 300 days of sunshine per year and the average temperature for the year hovers around 60.5 degrees. This means ample opportunities for enjoying a nice sunny day throughout the year. However, an abundance of sunshine means two things: plenty of UV rays and heat. No matter the time of year, it’s hard to enjoy the outdoors with the sun beating down. 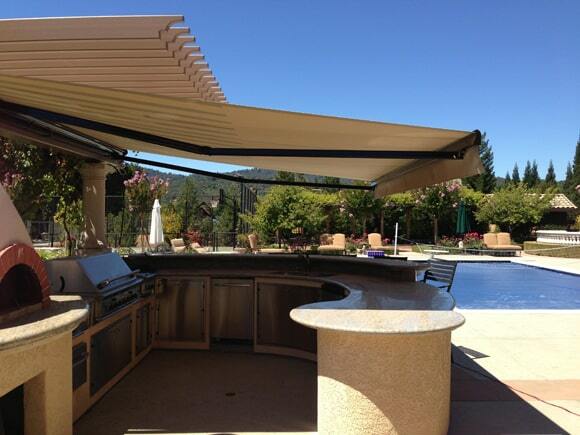 With a retractable awning in San Jose, shade and safety can be had with the simple push of a button. A retractable awning not only blocks harmful UV rays from the skin, it also stops sunlight from reaching the home’s interior, helping to save energy on cooling and heating costs, as well as protecting furniture and other valuables from being damaged due to constant exposure to sunlight. Although retractable awnings offer perfect protection against the sun, they’re not meant to withstand extreme weather such as heavy rain, wind or snow. Such extreme weather conditions can cause great damage to opened awnings. Because the weather in San Jose and the Bay Area is mild, you don’t have to worry too much about your awnings getting weather damaged, so these San Jose awnings provide an excellent shading solution year-round. Another advantage of the Bay Area’s favorable climate and lack of extreme weather: awning care is easy. Only proper care and handling with basic awning cleaning is needed for ERS retractable awnings to be long-lasting. The durable hardware and frames used require only minimal care to keep your motorized awnings operating smoothly for decades. We source our awning fabrics from Sunbrella, a product that is recommended by the Skin Cancer Foundation. ERS offers hundreds of striking patterns, colors, and styles of awning fabrics. However, for customers who are looking for something extra special, ERS can help add a touch of creativity via specific color themes or business logos for commercial awnings. Many folks in the Bay Area are sports fanatics, and we can even match colors for all the major teams in the region. Wow your tailgate buddies when hosting barbeques with a custom Sharks, A’s, 49ers, Raiders or Giants themed awning! ERS motorized retractable awnings use motors and controls produced by Somfy, a company that has produced more than 150 million motors since it was created. Somfy awning automation can be set up to be controlled by mobile devices such as a smartphone and tablet, providing another layer of customization and control. Get in Touch with ERS Today for Awnings San Jose! There are plenty of companies in the Bay Area that offer awnings, but European Rolling Shutters in San Jose is unique because they are one of the few exterior shading companies in the entire country that manufactures, sells, and installs ALL their own products. Founded in 1983, ERS Shading’s factory and showroom is located in San Jose. They service the entire Bay Area from Southern Marin Country to Monterey County and offer free in-home estimates. All the materials they use are imported directly from Europe, and all the assembly and manufacturing of their products is done in-house at their factory. 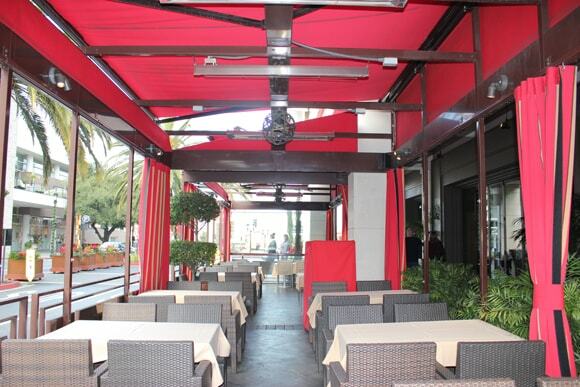 Besides awnings, ERS also offers retractable pergola covers, rolling shutters and solar screens. Whatever the problem is, ERS is sure to have the answer. Get in touch with us today!